The National Park Service had earlier told Patriot Prayer leader Joey Gibson that he had permission for the event, but withheld issuing the permit until the group agreed to several conditions, which include banning guns, tiki torches and other items that can be turned into weapons. The park service said denying Patriot Prayer a permit would violate the organization’s free speech rights. San Francisco’s mayor, U.S. Sen. Dianne Feinstein and U.S. Rep. Nancy Pelosi were among the Democratic politicians who had called on the federal agency to reject the permit. 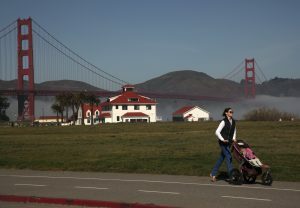 Mayor Ed Lee said Wednesday he was “disappointed” with the park service’s decision to issue the permit. Cities across the United States are on high alert following an Aug. 12 rally in Charlottesville, Virginia where Neo-Nazis, KKK members and various white nationalist factions carrying tiki torches clashed with counter-protesters, killing a 32-year-old woman. A week later, tens of thousands of people shouting anti-Nazi and anti-KKK slogans showed up at a conservative “free speech” rally in Boston, dwarfing participants. Nonetheless, extremist groups have attended previous Patriot Prayer events. One of its scheduled speakers, Kyle Chapman, was charged in nearby Alameda County last week with possession of an illegal baton. Chapman was captured on video swinging a baton at counter demonstrators protesting a Berkeley, California rally in support of President Donald Trump earlier this year. Gibson said he launched Patriot Prayer after several Trump supporters were beaten at a Trump campaign stop in San Jose, California last year.